I was first introduced to Lush over 12 years ago by Mr Mess (back when he was just my new suitor!). We went for a shopping day out and he suggested we go into Lush and pick out some goodies. I remember being overwhelmed by the colours and the fragrance. It fast became one of my favourite places to go, where I could browse for hours. Still to this day, it always reminds me of Mr Mess whenever I go in. Unfortunately, I don’t get into a Lush store as often as I would like any more and when I am there, I can’t spend nearly as much as I would like either. Whenever I’m in Nottingham or go for a day’s shopping at Meadowhall I make sure to pop my head around the day for a look around and maybe to pick up a few treats. A couple of weeks ago I went to a blogger meet up and afterwards a few of us took a walk around Nottingham. 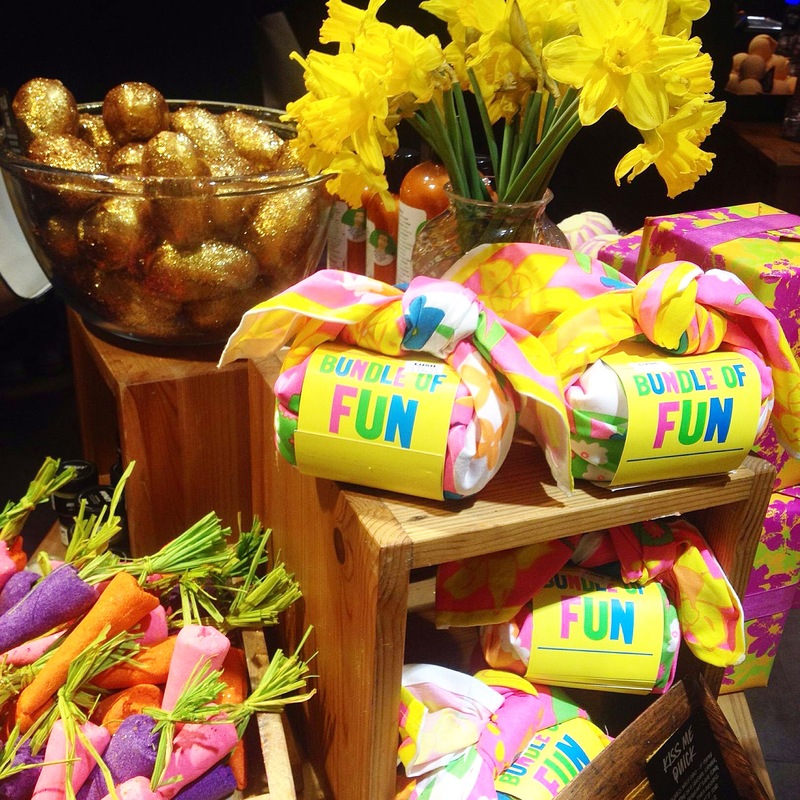 We decided to pop into Lush to check out their Easter collection, which I had seen glimpses of on Instagram. I’ve spoke to some people who are put off by the excess of glitter and overpowering fragrances. However, for me, they are what I love the most. My favourite ever product from Lush was the Glitter Bug massage bar. After using that I looked like Tinkerbell exploded on me! As I am basically a magpie in disguise, my eye was instantly drawn to the Golden Egg. This is complete Glitter heaven. Just holding it made me look like I’d been transformed into a unicorn! I was shedding sparkles where ever I walked. Now, Mr Mess will tell you that my sense of smell leaves A LOT to be desired, so pretty much all I can tell you about the smell is – it was nice! From looking on the website, I can tell you it features orange and cocoa butter, which know I’ve read that I can totally recognise. When I dropped it in the bath, I have to say it wasn’t the most impressive bath bomb I’ve ever used. I tried to film it bubbling away but my camera really didn’t do it justice. You couldn’t see the swirling streams of glitter in the water and the colour was just, well, yellow. It didn’t have a lot of visual impact. Still, there is a much better quality video on the Lush website if you want to see it in action. I had read complaints that the Golden Egg would stain the bath, but it certainly didn’t for me. There was a bit of a residue ring left after the water had run out, but a quick spritz with the shower and it was gone. 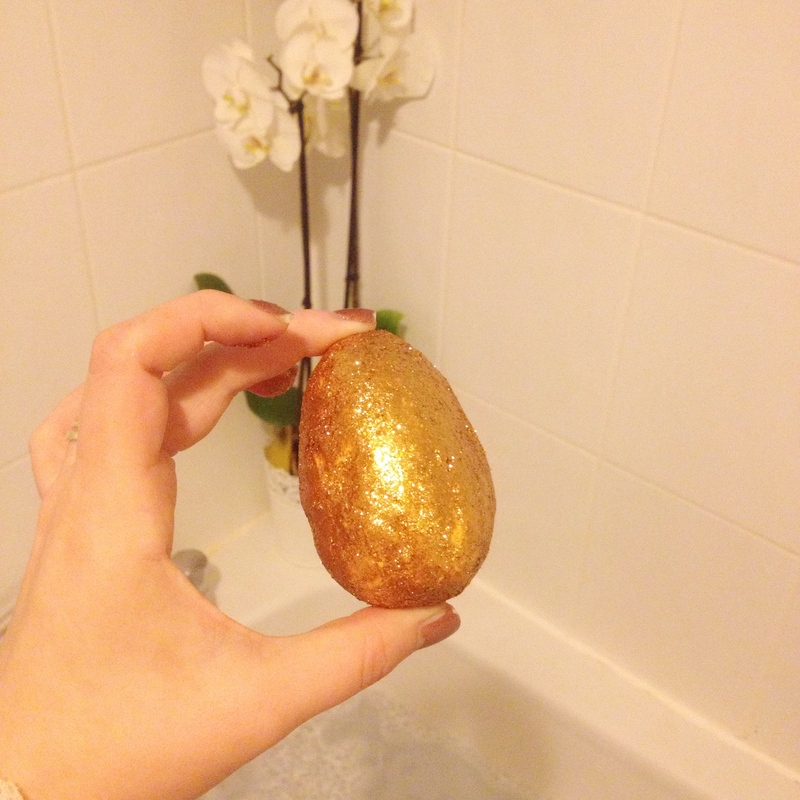 Overall I’d have to say the Golden Egg probably wouldn’t be my favourite ever Lush product I’ve featured. I wouldn’t rush to repurchase it, not because I didn’t like it but there are others I prefer. There are also tons that I haven’t tried yet so I’d probably want to save my money for one of those. I am, however, definitely glad that I bought it once I do think it is a novel addition to their Easter range. This entry was posted in Beauty and tagged bath bomb, bblogger, beauty, glitter, lush, nottingham, pampering, Relaxation, review. Ah I’m exactly the same – if I catch a glimpse of glitter I immediately gravitate towards it. I love this bath bomb (not my fave but it’s still fab), but I always find the glitter sticks to my bath and is a pain to clean off! Small price to pay though. Yay for the sparkle crew! I’ve never tried this one because I’ve always been worried that I’ll be covered in glitter afterwards haha! Stacey your photos are gorgeous, so colourful and Eastery! Such a shame that the impact of this egg in the bath wasn’t the best, I’m glad it didn’t stain your bath though! I really want to try out the carrots from the Easter range, they look fab! Great review 🙂 I love the look of this bath bomb, so would probably just keep it on the side haha. I bought this and was so disappointed especially after how much it cost. Won’t be rushing to buy it again. I didn’t find any problem with it staining bath. All that glitter would be like my worst nightmare, i hate it! Tasha louise recently posted…Current favourite makeup products! So sparkly!! I love the photos, so bright and colourful! I’ve seen this one myself in the LUSH store and I was put off by the glitter! I prefer the fancy colours of bath bombs (like intergalactic) rather than glitter so I feel like this one isn’t for me. Ah shame it wasn’t AS glittery in the bath as you hoped! I went to the lush leicester easter event and we were all immediately attracted to it, and ended up using it for a glitter face highlight haha!